Folding my arms across my chest, I raised one eyebrow and studied her. "And who you are made you want to run from me...again? I think you proved you can't do anything to make me want to give up on you." "No. But somehow it makes sense. Eli said that your dad was the last person I wanted to piss off. I couldn't imagine how your dad would be worse than Mason when he looks the way he does. But if they're both detectives, I get it." I smiled wryly and asked, "Would it make it even better for you to know they used to do undercover work? Like, they lived with, and were part of, gangs." Liam's face went blank before he started getting up. "Well, great knowing you." Liam watched me for a few seconds before saying, "A woman?" I shook my head and started to clarify, but he spoke again. "Not a woman? Uh...a unicorn?" "Even though there are so many things I hate about California, moving here was the best thing that could have happened because it brought me back to you." "Aw," I drawled sarcastically. "You must like me or something." 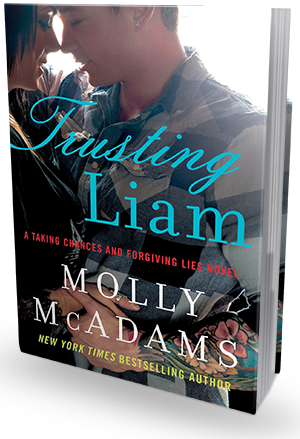 Trusting Liam is the merge of two series--Taking Chances and Forgiving Lies. Both of which I absolutely adore. As can be expected, considering they're by Molly McAdams and I have my ever-present addiction to her stories. Honestly, you don't HAVE to read the Taking Chances and Forgiving Lies books before this one if you don't want to. But I STRONGLY suggest it. This book will make you so incredibly happy if you do. And heads up: If you haven't read Taking Chances and Stealing Harper, there is going to be a HUGE spoiler for those books mentioned in this review. So BEWARE, my friends. When an author you love writes a book that brings the children of two of your favorite couples together for one beautiful romance, that is something to get excited for. So needless to say, I've been SO EXCITED for this book for a good long while. Like a year. Of flailing excitement. Finally getting this book in my hands was out of this world fantastic. But you know what was better? READING THIS BOOK. Because it was so great. I spent a great deal of this story smiling. The writing, the characters, the references to the past books (and CHASE)...it all filled me with all kinds of happiness. In Trusting Liam we have, of course, Liam. He's the son of Harper and Brandon (well, Chase biologically, but Brandon is Liam's dad in all ways that count due to the fact that, ya know...). He's strong and lovable and you can totally tell his parents have raised him right. We also have Kennedy--one of the twin daughters of Kash and Rachel. She's the wilder twin, and so stubborn. You can definitely see her parents in her. Liam and Kennedy together was the most amazing thing. This entire story was pretty much worlds colliding, but Liam and Kennedy together was PERFECTION. They complimented each other so well. Their banter was funny, their sweet moments heartwarming, and their smexy moments obviously revealing heaps of chemistry. They had bumps in the road, but I loved their story. The plot is largely driven by Liam and Kennedy figuring each other and their relationship out. But there's also a twist or two thrown in that mix things up and keep us on our toes. The story doesn't drag, and my interest was never lost. As I said--Molly McAdams' addicting writing was totally in play here. Overall, Trusting Liam is a sweet, addicting story full of characters--both new and old--and relationships that left my heart feeling so happy. I loved it!